Chris Kennedy has thrown his hat — and his family's enormous wealth — into the Illinois governor's race. But does he really represent a progressive option? There’s something about the Kennedys. It could be the name and accompanying brand; it could be a real current of talent and ambition that runs in the family; it could be the enormous hoard of inherited wealth that Joseph Kennedy’s progeny continues to benefit from. Whatever it is, there’s not a decade goes by that one of the Kennedys doesn’t throw his or her hat into the ring for some form of political office. This year, it’s Chris Kennedy, Chicago businessman and son of slain former attorney general and one-time presidential candidate Robert F. Kennedy, who in February announced his intention to run for governor of Illinois. Kennedy has maintained a progressive public image over the years. He donates to and is involved in a host of different charities. He runs a nonprofit that sells affordable groceries to low-income communities, citing a “commitment to social justice” inherited from his parents. That doesn’t mean Kennedy would bring much progressive change in Illinois, though. The state has seen two incredibly destructive years under current Republican governor Bruce Rauner, whose austerity politics brought about a protracted budget impasse and starved the state of sorely needed public funds. But Kennedy is far from an ideal candidate to take on Rauner’s reign of austerity. One of Kennedy’s major assets, he says, is his decades-long experience in the business world. “I’ve spent my entire life straddling the worlds of government and politics and the economy and business,” he told Chicago’s Daily Herald. To wit, Kennedy also appears to be a firm believer in the doctrine of centrist both-sidesism: that the problem with politics is that both major parties cater to their extremes, and what’s required is a politician who will bravely walk the middle of the road. Of course, Democrats have employed this kind of rhetoric as justification for drifting further and further to the right — despite the fact that the general population is far more inclined toward “extreme” left-wing policies than many politicians and commentators will have you believe. Kennedy’s worldview appears to be one of reflexively tacking to the center at all costs — much like another recent Democratic politician for whom that tactic failed miserably. “Every now and then, somebody emerges as a voice for folks in the middle who seems like a practical and thoughtful public servant . . . and that’s not the run-of-the-mill politician,” he added in the interview. Kennedy clearly sees himself as just this type of politician who will reflexively occupy the center to appeal to this mythical demographic. Not all of Kennedy’s business success has comported with his stated progressive values. For more than twenty years, Kennedy has served on the board of trustees of Ariel Investments’ Mutual Fund. Ariel Investments is headed by John Rogers, a close Obama associate (he’s currently serving on the board of directors of the incipient Obama Foundation) and a big believer of aiding poor black communities by helping them start hedge funds. Kennedy currently serves on its Management Contracts, Executive, and Governance Committee and chairs its Audit Committee. Kennedy’s involvement with Ariel has been profitable for him, bringing him $89,000 in 2014 alone. But the Ariel Mutual Fund has invested in companies that are a far cry from the progressive image Kennedy is now presenting. One company is Verizon, which has a history of misleading its customers, paying little in taxes, aiming to outsource jobs and cut worker pensions and disability payments, and for a time assisted the US government in spying on its customers. Others include tobacco giant Philip Morris (which, aside from being a tobacco company, has been accused of profiting from child labor), Acacia Research (a patent licensing company that was recently accused by Apple of being part of an antitrust conspiracy with Nokia, another company Ariel invests in), and private equity firm Blackstone, which the fund has invested in since at least as far back as 2012, the same year it began buying up foreclosed homes around the United States (including in Kennedy’s stomping ground of Chicago) and virtually operating as a slumlord. In 2012, Ariel had invested just shy of $37.5 million in the firm. Oilfield services giant Schlumberger, which received the largest criminal fine related to sanctions violations in US history in 2015 after it tried to hide its business with Iran and Sudan from authorities. Canada’s biggest oil producer, Suncor Energy, which aggressively exploits the incredibly pollutive Canadian oil sands and has been responsible for numerous oil, gas, and waste spills over the last few years. Occidental Petroleum, which a 2007 report found had flagrantly violated environmental rules in Peru and has been criticized by Human Rights Watch for its silent complicity in Colombian state atrocities in connection with a pipeline the company runs through sacred indigenous land. America’s fourth-largest utility, Southern Company, which secretly funded a prominent climate denial scientist, spent decades fighting environmental regulations (including Obama’s Clean Power Plan), and recently got in hot water for a coal plant rife with mismanagement and fraud that received millions of dollars of federal subsidies. And a plucky, little-known oil and gas company named ExxonMobil, which apparently has a few scandals of its own. It’s laudable that Kennedy managed to get LEED certification from the US Green Building Council for two of the buildings he ran and involved the Merchandise Mart in a variety of recycling programs. But those efforts are meaningless in the face of Ariel’s financial support for companies that exploit massive amounts of greenhouse gas-producing resources. Along with this, according to recent campaign finance disclosures, Kennedy received $1,000 from Mark Boling, the executive vice president and general counsel of Southwestern Energy Company. Boling and Southwestern parallel Kennedy’s approach to the issue of the environment. At the same time, Southwestern is the country’s fourth-largest producer of natural gas, eagerly fracking hundreds of thousands of acres of shale gas fields. Shale gas has a larger climate impact than other fossil fuels because it leaks methane, a potent greenhouse gas that is eighty times more powerful than carbon dioxide. But Southwestern presents itself as more environmentally and energy conscious than your average fossil fuel company because it uses less diesel for its rigs and pipes water in for fracking rather than trucking it in — in other words, using fewer matches to set the world on fire. The amount Boling gave to Kennedy — $1,000 — is negligible in the grand scheme of campaign finance. Instead of an attempt to sway Kennedy, it’s likely more a statement of kinship. Along with the rest of his family, Kennedy has also continued to benefit from a piece of accounting wizardry that has inoculated his family’s wealth from taxes. As Carol O’Donnell of Forbes outlined, the Kennedys have long used “dynasty trusts” to both protect their wealth from the greed of individual family members, as well as shield it from the government’s busy hands. But upon selling Merchandise Mart to Vornado Realty in 1998, the family also potentially avoided paying capital gains tax on the sale by entering into an “operating partnership unit” with the company, giving the Kennedys an ownership stake in Vornado. This also means that individual Kennedys have been reaping millions of dollars in dividends for years. 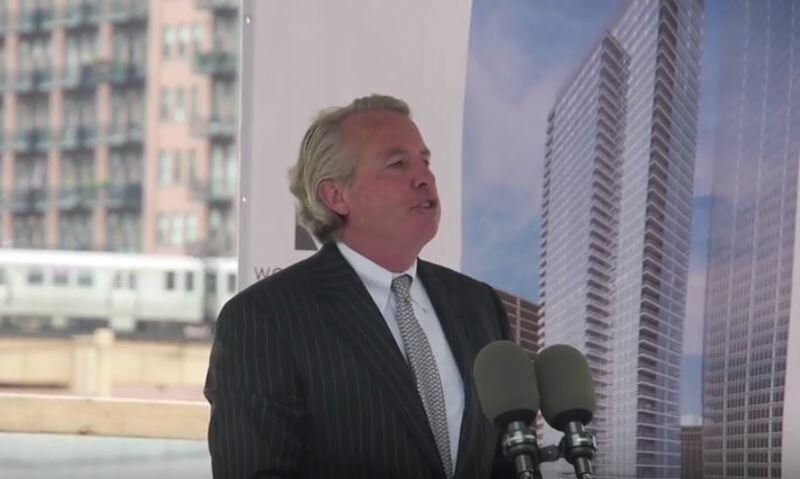 Given that Chris Kennedy was the Vornado Realty Trust’s executive officer from 2000 to 2011, it’s likely he did, too. 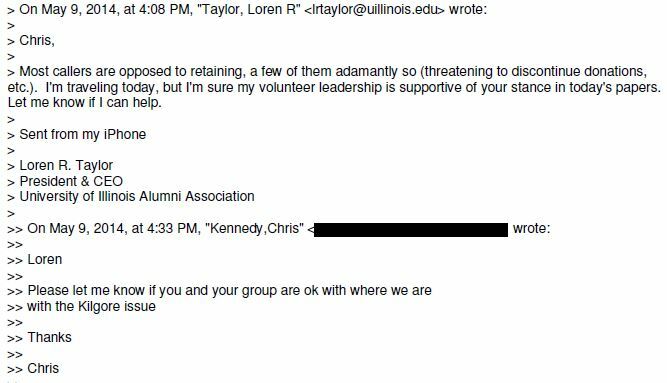 Perhaps the clearest example of Kennedy’s potential governing style can be found in his time at the University of Illinois, whose board of trustees he chaired from 2009 to 2015. During that time, Kennedy repeatedly rolled over — or even tacked to the right — at the slightest hint of controversy. Kennedy’s emails, some of which were released in past document dumps and others recently obtained through a Freedom of Information request, give some of the behind-the-scenes details of these incidents. First was the Bill Ayers episode in 2010. Ayers, a former Weather Underground member-turned-respected education professor at the University of Illinois at Chicago, became a political football when the McCain campaign used his vague acquaintance with Obama to smear the latter in 2008 as “palling around with terrorists.” Right-wing commentators took turns demonizing Ayers for acts he may or may not have committed forty years earlier. Two years later, Ayers was due to receive the largely honorific title of professor emeritus, given to “those individuals who have contributed measurably” to the university (rather than being a referendum on everything an individual had ever done in his or her life), according to the UIC faculty handbook. As per the university’s guidelines, emeritus nominations are approved by the department, the college dean, the chancellor or provost, and the president, before being approved by the board, which had never in living memory rejected emeritus status for a retiring professor. Ayers’s selection had already been approved by multiple university officials before it made it to the board, which typically acted as a rubber stamp. Kennedy, however, led the board in denying Ayers the title, on the basis that a book Ayers had helped write in 1974 while part of the Weather Underground appeared to be dedicated in part to Sirhan Sirhan, the man who had killed Kennedy’s father. Ayers says he was told by those in the know that Kennedy had based his decision on Sean Hannity segments like this one. The faculty senate criticized the decision. One professor told the Tribune she was “shocked,” given that Ayers had “a forty-seven-page resume of academic accomplishments.” Ayers told Newsweek at the time that he “felt very sad” that Kennedy and his family had to “revisit” the incident, but claimed the inclusion of Sirhan was not his decision. He explains that the page in question — a wall of hundreds of names with the dedication “to all who continue to fight, to all political prisoners in the US” — was drawn up by an artist and that Ayers didn’t know most of the names on the list. Moreover, he says, the page was meant as a criticism of the criminal justice system, the idea being that “all prisoners are political prisoners.” Ayers says the board never got in touch with him for an explanation before voting. Next was the case of James Kilgore, an adjunct professor at UIC in Global Studies and African Studies who the local News-Gazette revealed in 2014 had been a former member of an admittedly bizarre 1970s leftist revolutionary group, the Symbionese Liberation Army. After twenty-seven years on the run, Kilgore had been convicted for his part in a 1975 bank robbery that had left one person dead. He served a six-year sentence, during which time he was a model prisoner, was paroled in 2009, and soon after got a job at UIC, where his wife worked as an associate professor of gender and women’s studies. Kilgore eventually served his sentence, left prison remorseful for his actions, and got a job. But the university didn’t see it that way, and after the paper’s story, the administration cancelled his contract in early 2014 without reason, despite his glowing performance reviews. In May 2014, Kennedy told the News-Gazette that Kilgore was “a domestic terrorist bent on overthrowing the government by targeting the murder of police,” despite the fact that it had been more than three decades since his crime. “We’re not reacting to public pressure,” he said, and denied that it was an issue of academic freedom because “this is an hourly employee who doesn’t have tenure.” (One dissenter emailed Kennedy that he was “disturbed” by this “inane statement,” because of two-thirds of the country’s faculty were part-time, and “academic freedom is a right awarded to all faculty”). Kennedy’s emails suggest public pressure was involved. The same day Kennedy’s comments were printed by the News-Gazette, Kennedy checked with the president of the university’s alumni association whether or not alumni were supportive of his actions. She told him that “most callers are opposed to retaining [Kilgore],” with a few threatening to stop donating. In an earlier email to University of Illinois president Robert Easter about the Gazette story, Kennedy had noted that much of the university’s funding came from state taxes, which meant the university “need[ed] to be sensitive to tax payers.” “I think they are going to be offended by the notion that their taxes are going to support the lifestyle and career of a fellow who tried to overthrow the US government and targeted police officers and innocent victims for killings,” he said. Kennedy registered his concern that if the university didn’t “reflect the values of the state,” angry taxpayers would deprive the school of funds. The email also demonstrated some decidedly un-progressive thinking on Kennedy’s part when it came to the issue of criminal rehabilitation. So to be clear, Chris Kennedy believes ex-convicts should be rehabilitated and reintegrated into society, but not if it involves any “public support,” or if it involves them being hired by a government entity. 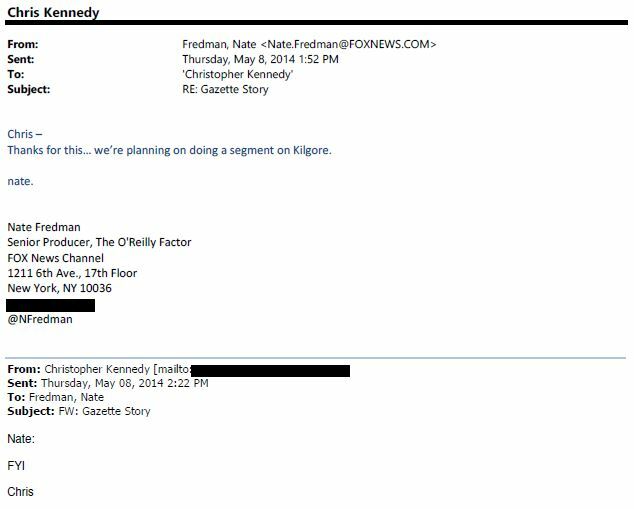 Kennedy later forwarded this email to a producer at the O’Reilly Factor with the message “FYI,” at which point he was informed the show was “planning on doing a segment on Kilgore.” It’s not clear if Kennedy was already aware of this when he sent the message. Kennedy’s obsession with “civility” — which had also played a role in his decision over Ayers — reared its head later that year, over the decision to “un-hire” Steven Salaita. Salaita, a Palestinian-American professor, had been offered and accepted a tenured position at the University of Illinois at Urbana-Champaign in 2013, signing a form that October to signify his accepting the position. He resigned from his previous job and was in the process of moving himself and his family to Illinois when the board of trustees decided in 2014 to suddenly rescind the offer. The reason: a handful of tweets Salaita had sent in the middle of Israel’s Operation Protective Edge, the brutal 2014 military operation during which Israel indiscriminately killed close to 1,500 Palestinian civilians in Gaza, nearly a third of them children. (Seven Israeli civilians had been killed, by contrast). Salaita’s tweets were obviously not bigoted, given that they were criticisms aimed at Israeli state actions and not at Jewish people in general. As others pointed out, mere months before, Salaita had sent a series of other tweets criticizing rapper Macklemore for donning an obviously racist costume in the style of a Jewish caricature. But that’s exactly what the board’s decision did, upending Salaita’s life. He and his wife (who had also quit her job for the move) suddenly lost their income, their health insurance, and had nowhere to live, leading them to move in with his parents in Washington, DC. The decision ignited widespread criticism. 330 faculty members signed an open letter expressing concern about the decision, while more than a dozen departments voted “no confidence” in the Urbana-Champaign campus chancellor, Phyllis Wise, over the incident. Scholars cancelled lectures and events at the school, while high-profile academic organizations condemned the decision, including the American Association of University Professors, which censured the school. Salaita eventually received an $875,000 settlement from the university, though it refused to reinstate him. A year later, Kennedy accepted a “Spirit of Courage” award from the Simon Wiesenthal Center for his role in the Salaita affair. At this point it’s not exactly clear what exactly Kennedy stands for, policy-wise. Thus far, he’s largely avoided any policy pronouncements, electing instead to campaign on opposition to the calamitous Governor Rauner. But as the Clinton campaign recently learned, defining yourself by what you’re against, not what you’re for, can be a disastrous strategy. Some of Kennedy’s rhetoric suggests he has learnt from the discontent that has, in different ways, fueled the success of both Donald Trump and Bernie Sanders. As Kennedy’s own campaign website makes clear, “restoring the American Dream” — or some variation on this phrase — looks to be a core component of his message. But what exactly would this mean in practice? Kennedy has so far been quiet on exactly what kind of policies he’d support to ensure the continued existence of this American dream. Is he going to push, for instance, for the kinds of redistributive policies that Democrats once pushed for and that helped propel the widespread enthusiasm for Sanders’s campaign? When asked by the Daily Herald how he would fix Illinois’s budget shortfall, Kennedy offered a comically non-committal answer, saying he didn’t “think we can tax our way out of this mess and we can’t cut our way out of it,” avoiding giving a specific solution and telling the paper he needed to learn more about the size of the state’s deficit. I sent a message to the Kennedy campaign asking for the candidate’s positions on a number of issues, such as supporting a $15 minimum wage, replacing Illinois’s flat tax with a progressive income tax that takes more from the wealthy, reversing various cuts to public services, and banning fracking in the state. That message has so far not been returned. I sent the same questions to Kennedy’s spokesperson, Mark Bergman. That has also gone unanswered. (Kennedy has, however, recently expressed his support for the Fight for 15 movement, and has mentioned changing Illinois’s flat tax in a recent campaign email). While it’s still early going, Kennedy has some key institutional backing for his run. He appears to have the backing of Democratic House Speaker Michael Madigan, who said Kennedy would make an “excellent candidate,” and whose staffers met with Kennedy during the DNC last year. There’s something else helpful that Kennedy would bring to the campaign which Madigan didn’t mention: his vast personal wealth. This is particularly important since Governor Rauner threw down the gauntlet by giving his own campaign a record $50 million donation at the end of last year. Kennedy recently responded by giving himself a $250,100 donation. The strangely un-rounded sum is significant. Under Illinois law, when a self-funded candidate or family member donates more than $250,000 twelve months prior to an election — as Kennedy now has — it lifts the spending caps on all candidates. Kennedy is essentially telling Rauner and all of Illinois that he’s prepared to spend untold amounts of money to win this election. Perhaps he’ll need it, given that billionaire J. B. Pritzker is also fighting for the Democratic nomination. The Illinois Democratic primary is still nearly a year away, so it’s hardly a foregone conclusion that the Illinois governor’s race will end up a contest between two one-percenters. And perhaps Kennedy will even adopt an unabashedly progressive platform between now and then. Given his track record, however, Illinoisans shouldn’t hold their breath.